Against our own better judgment, we love a good Ken and Barbie story. The swift and sudden love affair between Kanye West and Kim Kardashian has definitely stocked the Dreamhouse with bootylicious, sartorial splendor. Bring out the binoculars! We're keeping tabs on this well-heeled pair. In some ways, it's so perfect-like an edgier, real-life Bella and Edward (or Rachel and Finn)-that we want to see their whirlwind romance go all the way. Like, ALL the way…to a misty-eyed proposal, a blended name (Kanyashian? ), and a televised E! special that captures every second of their…oops. Never mind. But, much like those famed Mattel figurines, one has to wonder if Kim Kardashian's latest romance-she didn't wait a nanosecond post-Humphries-is the legit. Or is it merely a lifelike facsimile of love, teetering on permanent tippy-toes with a plastic, plastered-on smile? 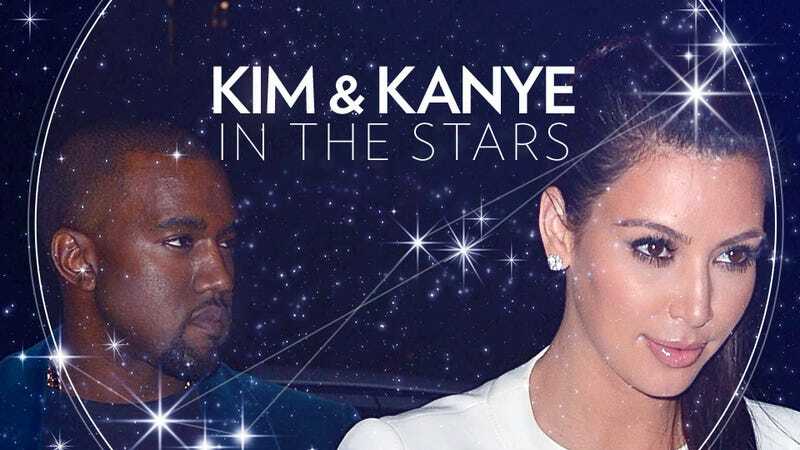 So here's our as-unbiased-as-possible astrological analysis of Kim and Kanye's charts. Breathe In. Suspend Judgment. Digest. Decide for yourself. As air signs-she's a Libra, he's a Gemini-they're an easy match that can be playful and free together. Kris Humphries was also an air sign (Aquarius), and indeed, there was once a pigtail-pulling junior high-ishness to their televised togetherness…before the bad men with the cameras spoiled everything. While Kim's new relationship will be a touch more sophisticated, these two can still be silly and light together. On a deeper level, Kim and Kanye both have Pisces moons. The moon in the chart determines your romantic nature, your deepest desires and what you need to feel emotionally secure. Hello, soulmates. Having the same moon sign provides instant comfort and familiarity, a cosmic tea-for-two. Pisces is the sign of fantasy, illusion, glamour and vulnerability, and the Pisces moon person is "in love with love." The tendency to idealize others is strong, especially in Kim's stars, as the moon is the "handle" of her bucket-shaped chart, putting extra emphasis on its role. With their shared Pisces moons, Kim and Kanye won't have to explain certain things to each other, like why they might spend a year's tuition on a handbag, or their unusual closeness to their mothers. Their Venus signs, which indicate romantic styles, are also an easy fit. Kim's Venus is in Virgo, Kanye's is in Taurus-both more traditional earth signs. They each need a romantic partner to ground them, although it can be a bit of a clash of the person is TOO conventional…for example, wanting to settle in the (yawn) Midwest where even the paparazzi don't roam. There's a selfish element to Kanye's chart (ya think?) that could be troublesome. His south node (past life sign) is in Aries, while his north node (karmic destiny point) is in Libra. This indicates that relationships are unfamiliar territory to him in many ways. He'll need to overcome Aries traits of ego, putting his needs first, and being, well, a brat. Since his north node is Libra, which is Kim's sign, this indicates that she's entered his life as a spiritual teacher. That should be an interesting lesson for the "college dropout." His soul school is to learn how to compromise, share the spotlight and be in a long-term relationship. This makes us a little bit nervous for Kim, who seems to keep repeating the same fear-of-being-alone serial monogamy routine. His potential skittishness down the line could hit some unhealed wounds for Kim. If there was ever a year for Kanye West to slip behind the scenes and fall in love, this is it. From June 2011-June 2012 expansive Jupiter is in Taurus, Kanye's solar twelfth house of soulmates, healing and closure. This fantasy-fueled cycle happens once every 12 years. Many people meet their marriage partners or true loves while Jupiter is in their solar twelfth house. (To wit: Katie Holmes, when she was heavy-drinking the Tom Cruise Kool-Aid in 2005). As for Kim? Since March 2011, Kim has had unpredictable Uranus in her seventh house of relationships (Aries), a cycle that continues until 2018. Uranus can bring sudden affairs-and divorces-which pretty much covers the whole Kris Humpries debacle. The Kanye relationship, legit though it may be, seems to have started just as quickly. But luck may be a lady here. Jupiter, planet of risk, abundance and gambling, is in Kim's eighth house of intimacy from June 2011-June 2012. This is definitely her time to dust off and try again. On June 11, lucky Jupiter will begin a yearlong visit to Gemini, setting off a fast-paced year for Kanye. His personal projects could shoot into the stratosphere, consuming his attention. Since he was born with Jupiter in Gemini, this will be a doubly successful year. He may need to devote more solo time to his projects. Will it "all fall down" when the curvaceous Kardashian has to drag him out of the studio? Hopefully not. However, Kim has some lessons in store about flying solo herself. Stern Saturn, the planet of maturity and tough lessons, is in Libra (Kim's sign) from October 2009-October 2012. During this cycle, Libras MUST learn how to stand on their own two feet and cure their romance-a-holic issues. Libra is the zodiac's partnership sign, and indeed, it can be tough for them to be alone. Saturn is here to teach this sign a hard lesson: how to feel like "enough" on their own. On the one hand, Jupiter will be in Kim's free-spirited ninth house of travel all summer, so she should definitely board a few planes and see the world with her man. However, Saturn in Libra will slap her Rolexed wrist-and not lightly-if she neglects her own empire to follow his gold chains, Parisian accessories and futuristic sneakers as they circle the globe. How about making this a two-way street, guys? Kim, you've chosen a more compatible match this time. However, to avoid another "Kar-Krash-ian" train wreck, continue working on becoming your own person. Cut the cord with mama and the sisters. Learn how to truly be comfortable on your own; the Gemini man doesn't take kindly to cling-ons. Kanye will need his own space to write, spit, dream, and be his crazy Gemini self. Grab your own diamond mic and keep rocking. Up your sensitivity and tone down that ego-it's not all about you. Also remember: this girl is a Libra and she wants to have fun. Enjoy pulling out the stops for your social butterfly and being a "man with a slow hand" (easy enough with your Venus and Mars in sensual Taurus). With the Sun and Jupiter together in your chart, you can be a big talker. Make sure you come through and deliver on those promises if you don't want Kim to dash. A busy, active and independent year is in store for both Kim and Kanye, starting in mid-June. They will be decidedly less dreamy and may have troubling getting their active schedules to mesh. Can you say quickie? They may need to be a lot more creative to get that quality time. Also, from May 15-June 27, love planet Venus goes retrograde (backward) in Gemini, Kanye's sign. He may have a temporary freakout or need some time apart to think. Call off Kris Jenner and her script doctors! This would NOT be the time to stick a camera in Kanye's face, even though he so seems to enjoy them. If Kim and Kanye can make it to June 2013, when Jupiter moves into stable, earth-ruled parts of their chart, we'll give our final cosmic approval. Until then, keep the Swarovski crystals at bay! Identical twin sisters Tali and Ophira Edut — known as The AstroTwins — reach millions every month as the astrologers for Elle.com, TV Guide and Lifetime, and the authors of The AstroTwins' Love Zodiac: The Essential Astrology Guide for Women (Sourcebooks), a 450-page guide to the men of every sign. Tali and Ophira have read charts for celebrities including Beyoncé, LeAnn Rimes, Stevie Wonder and Sting. As the co-creators of AstroStyle.com and Momstrology.com, The AstroTwins help clients and readers create amazing lives with their unique, applied method of astrology and coaching. They are available for private astrology readings by phone or in person. Follow them on Twitter: @astrotwins and @momstrology.